Under OSHA’s standards, employers are required to provide a workplace for their employees that is free of hazardous conditions or activities. Occupational heat exposure is one area where OSHA takes active steps to educate employers on keeping their employees safe. Each summer they launch a Campaign to Prevent Heat Illness in Outdoor Workers, which aims to educate both employers and employees about the dangers of heat-related illnesses and the steps they can take to prevent it. Because of campaigns like this, we often think consider the heat exposure that outdoor workers experience in the warmer months. But indoor workers in certain industries are also exposed to environments where heat is a problem. As OSHA puts it, any workplace where “operations involve high air temperatures, radiant heat sources, high humidity, direct physical contact with hot objects, or strenuous physical activities have a high potential for causing heat-related illness.” These workplaces could include foundries, brick/ceramic plants, factories, electrical utility rooms, bakeries, laundries, commercial kitchens, chemical plants, mines, steam tunnels, and any manufacturing facility. Reducing the effects of that radiant heat, humidity and air temperatures should be a top priority. Most heat-related health problems can be prevented or reduced if companies take proper steps to protect their staff. In order to keep workers safe, employers can take steps to prevent heat-related illnesses. The best way to do this is by making the work environment cooler with engineering controls. In addition to increasing ventilation and using air conditioning whenever possible, one of the best ways to cool an environment is by reducing radiant heat through mechanical insulation. 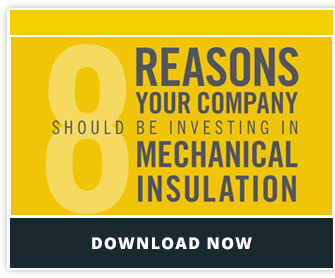 Mechanical insulation helps prevent heat gains and losses in mechanical equipment, and its main benefit is that it helps facilities save money and energy. But it also plays a huge role in personnel protection by preventing people from coming into contact with hot pipes and other mechanical equipment. Insulation also helps reduce the temperature of a space where mechanical equipment and piping is generating heat. Creating a safe working environment includes keeping the workspace at a tolerable environment. Heat related illnesses can occur in both outdoor and indoor workplaces, but mechanical insulation can help protect staff and contribute to a healthier work environment.